In today's post we will cover the when, where, and how of driver license renewal in Japan. Disclaimer: This guide is only intended to be a general outline. The exact procedures can differ from prefecture to prefecture. Green- Beginners (shoshinsha 初心者) license. This is the first license you get regardless of whether you have converted your foriegn license or started from scratch. It is valid for 3 years, always expiring a month after your birthday. Blue- A standard license. This can either be a regular license (ippan untensha 一般運転者) or, if you have more than 3 penalty points on your license and/or have been given a citation more than one time you are classified as "driver with violations" (ihan untensha 違反運転者). This license is good for 3 years if you are over 70 years old or have less than 5 years of driving experience. 4 years if you are 70 years old and 5 years if you are under 70. If you are a driver with violations, it is only good for 3 years regardless of age. The points marked with an asterisk are not required in all prefectures. Some places in Tokyo are known to look at your alien card while others don't ask for any ID at all. In my case, my personal seal was also not necessary. Play it safe. If your address changes from the time your notification post card arrives to the time you go to renew your license and you have not already changed it at your local police station, you can use your alien registration card or any post marked utility bill, public service receipt, etc. as proof of address. There are several places where you can complete the renewal process. Drivers License Centers (unten menkyosho senta 運転免許証センター) are the best bet since they tend to offer smooth service, weekend hours, and you don't need to bring your own pictures. With a few exceptions, license are issued on the same day the renewal is completed. 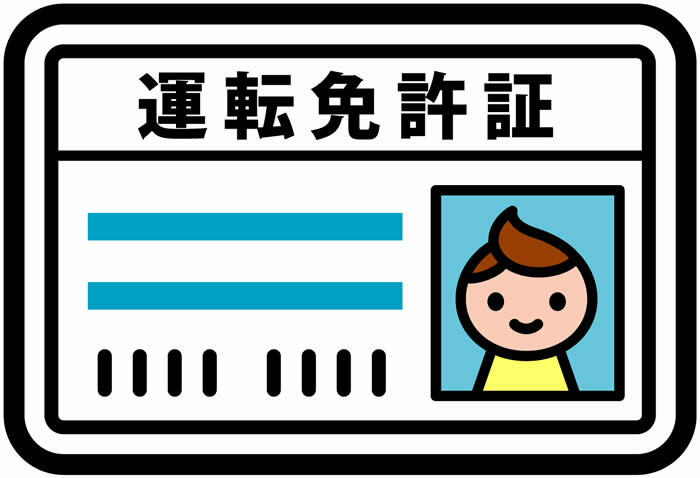 The facilities where you can get your license renewed are written on the notification post card in addition to the reception hours (uketsuke jikan 受付時間). For weekend hours at Drivers License Centers, make sure to check with your local prefecture police since some operate only on Saturday and others on Sunday. If the prefecture has more than one center then there is a good chance that only one will keep weekend hours at a time. Finally, license renewal generally needs to be done within your home prefecture. The exception to this rule is for drivers who hold gold licenses. Gold license holders can renew licenses at Drivers License Centers outside of the prefecture (called keiyuchi shinsei 経由地申請). This simply means that you complete all the necessary procedures at the out-of-prefecture license center and they will then post the information to your home prefecture. You will have to wait a week or more for the authorities in your home prefecture to send the license back to you in addition to paying extra fees for the processing and postage. The renewal process does not require any reservations. The only caveat is that you can only do it during the dates printed on your notification post card (usually a month before your birthday). If you decide to go to the Drivers License Center during weekend hours, its best if you go as early as possible since staff is kept to a minimum and the parking lots tend to fill up very fast. People may start queuing up an hour before the doors open. Step 1 The exact order and procedures may be different where you live but for the most part the day will start with an employee checking you have your license and post card. Next, they'll ask if you need a change of address form, then photocopy your license. Step 2 You will be given a self assessment medical exam sheet (kenko shindan-sho 健康診断書) and a sheet to enter your your 8-digit license PIN number (ansho bango 暗証番号). Some prefectures offer these forms in languages other than Japanese. Step 3 Pay at a separate window and the employees will either stamp your post card or take it away from you and give you a receipt and possibly other paperwork. Step 4 Eye check. Involves pointing to where the opening of a small circle is. If you have insufficient vision or need lenses you may be asked to check your peripheral vision and depth of field vision at a separate station. Part 5 Photo. This only applies to people going to Drivers License Centers. Make sure to sit perfectly (and I mean perfectly) straight and don't smile. Beginner license holders- 2 hour mandatory safety class. Usually consisting of a video and and a retired police officer telling accident horror stories. Don't fall asleep! Regular license holders- 1 hour mandatory safety class. Exemplary driver- 30 minute safety course. Some prefectures are particularly strict about making you check attendance (even during bathroom breaks) while others don't really seem to care as long as you hang out for the whole class. Part 7 Get your attendance slip stamped etc. and head to the next area. This is where you get your new license and hand your old one in. Often times your old license will be handed back to you with holes punched in it. Part 8 (optional) Go to the IC license kiosk (little ATM-like terminals), scan your license, and enter your new PIN to make sure the info on the IC chip matches what is printed on your card. You can also fill out the organ donor information on the back of your license if you so desire. And that's it. You are free to go home, kick back, and drink a cold one, content in the knowledge that you won't have to wait in another driving center for at least 3 to 5 years. For the record, I was able to wear contacts without any trouble on my renewal day. I just had to tell the officer in the eye exam area that I wear them daily and need them when driving. I had to renew my license early because I was abroad during the renewsl period. You can do this if you take your passport to the drivers license center but you cant renew like this at a police station. I had no problems. It was like a normal renewal but they chexked my passport a couple of times. Hi, I'm going to renew my license next Sunday (May 26) and found this page very useful - much more so than the 'English guide' you can phone up using the number on the official postcard. I have just one question, about the "8-digit PIN number". Is this something I will get on Sunday, or a number I am expected to know before I go? I seem to recall entering a PIN 3 years ago when I got my license, but I've no idea what it was - do I need to use that same number? Also, a word of warning to anyone getting their license renewed at a police station. My wife recently went through the process (gold license) and it takes over a month to process a new license. No, I am no kidding. They will extend your renewal date if necessary but you may not be able to use it as an official ID. However, when I renewed at the driving license center everything was processed on the same day. Just a small correction: I let my license expire, because I am dumb. I wasn't out of the country, I didn't have any kind of legitimate excuse, and I had even managed to lose the renewal card. I didn't have to start over from scratch. I wasn't able to do my renewal on a weekend, which sucked, but I didn't have any problems, either. I had all the necessary paperwork, stood in all the various lines, paid the necessary fees, and sat through the two-hour safety presentation, and was ultimately issued a new license without a problem. Even changed me from a green to a blue license, so the fact that I'd let the thing expire didn't cause them to wipe my driving record (apparently) (another site had warned of this possibility). All this only took an afternoon; I didn't get to the center until around 1230. So, it's possible to renew your license even if it's expired--UNLESS it has been expired for more than six months, in which case you're boned. Still, I don't recommend it. Get that sh*t renewed pronto. Anonymous: Thank you for the awesome comment. It's useful to know how things actually go down when you don't color within the lines in Japan, and I'm sure some of our readers will be very grateful for the info. Anon- Thanks for the advice about late renewals. Although I should caution readers that the decision to allow someone to renew an expired license is pretty much at the whim of what ever official that happens to be working that day. The teacher sitting next to me told me she had to re-attend driving school from scratch after missing the deadline by 2 months. Also, if you are caught driving, you can be considered to be driving without a license, the sentence for which was just raised to 10 years in prison and a 500,000 fine. I have gone through this procedure quite a few times now, sat through 2 hour safety lectures (in Japanese) doing my best to look attentive. During these lectures (I now understand Japanese) there is a part that deals with uncontrolled crossings and apparently one should stop if someone is waiting to cross. Do so at your peril as the following vehicle is likely to rear end you or at least sound their horn at you, moreover the person or people you stopped for will look at you and hesitate to cross. I hail from the UK where most drivers will stop if a pedestrian is waiting to cross. In conclusion these crossings are a waste of white paint. Hi, i just renewed my license but wasn't able to go to ic license kiosk for my license scanning. do i have to go back just to scan my license? i live in Niiza and Konosu is too far from me. please i need your advuse before i go. Forgot to change my address on the license.... no postcard... What should I do?? I will be leaving the country to go back to America for about a years time if everything works out and I will be missing my renewal date entirely. If I DO come back and just show them my passport will I be able to get it renewed without a problem? 1. You have to go to a Driving License Center on a weekday. They may do the preliminary decision (see 2. below) on a weekend, but they will ask you to come back on a weekday for the actual renewal. 2. There is some preliminary process where someone decides whether you will be allowed to renew despite missing the expiration date. My excuse was that I had moved house (and registered the address change on the old driving licence) and I had not received the renewal notice. 3. I was asked whether I was in Japan on the expiration date of the old licence. I answered "yes". They did not check my passport to confirm this. It appears that for some reason it is important to have been in Japan on the expiration date. - You DO need to bring a 3cm x 2.4 cm picture. This will be attached to the application form and is separate from the picture for the license itself, which you do NOT need to bring. - You need to bring a residence certificate issued by your local ward, in addition to your foreigner residence card. Without it, you will have to get it first and come back. - I was not asked for my passport nor did I need my hanko. I am sitting to get my first one. As being german they are quite easy going on what's needed. Edit: I got a 5 years license (regular) though it is my first time converting it. I was in the hospital recently and am back home now. My license will expire soon, but I'm not sure I can sit for 1 or 2 hours for the class. I only have a genski (scooter) license. Blue, no violations. My friend says if I go to a police station, I won't have to take that safety class. I'm in Koganei city, closest to Fuchu driving center. Very useful info. I'm in the middle of a situation where I hadn't noticed my license had expired and now I need the thing in a hurry. The posts on this subject are invaluable, and instil some confidence that it is at least possible. This information is priceless! Going through my first ever renewal this weekend at the kanagawa license center. Thanks!